The other day as I was baking some bread, I heard a rustling. 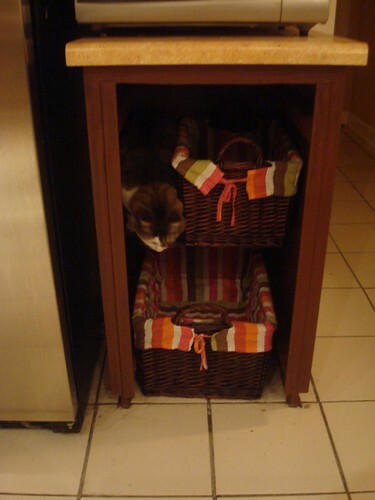 I looked over and saw Abby nestled next to the basket that holds our kitchen towels. I had just enough time to grab my camera and take this shot before she jumped down (the kitty guilt!). It's always funny to stumble upon a cat doing something silly like that. When Dave first got Erin, she climbed into the TV console and laid down. Only her back end was sticking out of the little cubby. Silly fuzzies!